A delicious blend of natural fruits and spices that brews up a mouthwatering cup of herbal tea. Rich in Vitamin C and iron, Fruit Mélange Infusion is an ideal dietary supplement for promoting health and preventing diseases. Benefits of this drink include aiding digestion, promoting beautiful skin, reducing fatigue, and improving concentration. This infusion’s high level of antioxidant protects the body from cell damage caused by free radicals and helps to maintain healthy blood vessels. 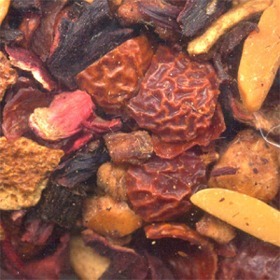 All Fruit Mélange Infusions contain rosehips and/or hibiscus. Rosehips are the buds that remain after the roses have fallen. It is a good source of vitamin C that can help to rejuvenate the skin. Hibiscus is another rich source of vitamin C and iron. It is also a calming herb that can help to lower the blood pressure. Rosehips, hibiscus, apple peels, orange peels, almond, cinnamon, and pieces of vanilla with cinnamon aroma.